The construction team at Max Condos has been working hard throughout the Winter, and it's time to share the progress we've made! Since January 2019, we've been busy finishing the interior of the underground garage. Trades will spend the next six months installing the electrical and residential water systems. The intricate structural layout of the ground floor is also progressing and this ground floor area will become the future lobby! In the photo below, we can see our workers assembling the vertical form that will become a future concrete wall. This wall will help to support the underside of the third floor, for which concrete will be poured in the coming weeks. 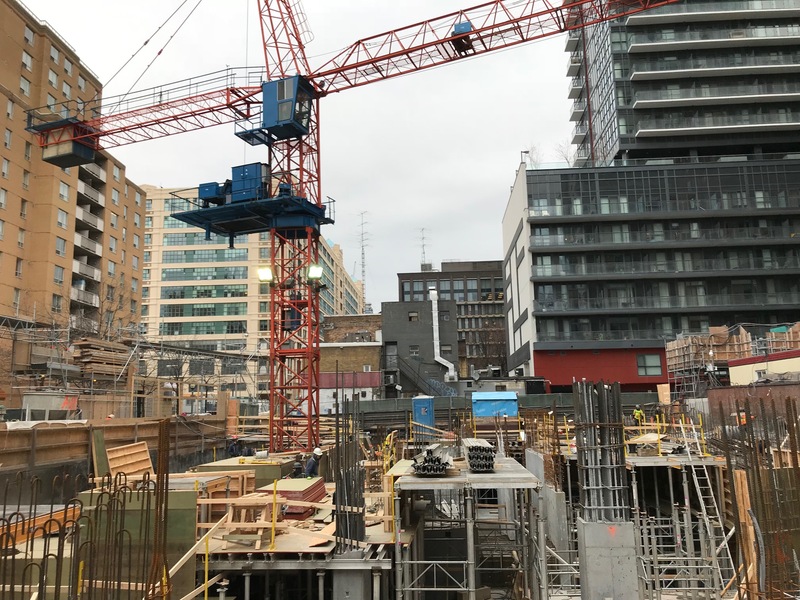 At the present time, workers are busy forming the first level of residential suites that begin on the second floor and the crane is expected to be raised some time next month to facilitate work on the floors above. We can expect to be above the fifth floor by the early days of Summer! Max Condos is an exciting project for Tribute Communities. Located just steps from the corner of Church and Dundas, it is in the heart of downtown's most central neighbourhood. With so many convenient area amenities and spectacular suite designs, purchasers here will enjoy a world of maximum possibility.